This is the reading room where you can study for your exams, or study maths and occult (the really powerful occult books are stored in the basement and you need a permission to examine them). You can also study in your own room, but there might be strange disturbances which can break your concentration... At the right edge is the card file, where you can check the location of the books in the library. After you know the book's location, you can go and find it, and borrow it from the librarian. And behind the door is professor Armitage's office. So this is a place you will be spending quite a lot of time. What about a little side research off the main route? If you mean the librarian lady, I didn't see it first, but now that you said it... We'll fix it! This can turn me on or off depending on the feel of the place. In this case I look forward to spending time there so job well done! Great to hear that! It was somehow quite difficult to design that room, because there needs to be a lot of functionality. I hope I have some time to add few extra decorations there. I love everything about this project. Thanks! I'm a fan of your work too! Well, actually I forgot to tell that Walter is working on a theory, which combines magic with science. So you can also work on that (your occult and math skills add to your theory), and if you manage to write a proper thesis, you can publish it in the University newspaper, and get some pocket money! Will this game be taking place during the prohibition? It might be an interesting play through if Walter were to blow off his classes and spend all his time in speakeasies and pool halls, though I imagine if he gets arrested or expelled that would probably bring the game to an early end. Awwww...But stereotyped purplely-written lowlife thugs is an awesome Lovecraft trope!!! Sorry it's been a while since the last update! Good news is that I've been busy working with the game and made some progress. I wanted to show you something bit different this time. This background is still a bit work-in-progress, but I wanted to share it with you before the Christmas holidays. It's one of the dream scenes, a very alien place with a strange geometry and physics. Actually it's a mini-game with several stages and parallax scrolling, and this is the first part of it. It's been a lot of work figuring this out, and because there is a lot of animation going on, it will probably be the most resource-heavy scene in the whole game (I hope that it runs smoothly with older computers...). Anyway, I hope you like it, and happy holidays! Agreed! But don't worry, there will be at least one tough street kid hanging around in Orne's Gangway, and hopefully also a band of muggers. By the way, nice work on Chronicle of Innsmouth, I was naturally very interested to see how it turned out! First of all, the game has a sound designer! Antti is a very talented sound designer, who's been working mostly on television and movies. We have also worked together earlier, and he's a great guy, so I'm very happy that he's onboard. Now I can focus more on the other aspects of the game, and don't have to worry about the audio that much. Troy Sterling Nies has agreed to compose the music for The Witch House! I couldn't be happier about our little team! So no new screenshots this time, eventhough the game has progressed nicely lately. And also thanks for the people who have contacted me and offered their help in the audio department! There are some new backgrounds, but most of them are missing final tweaks or characters, so I won't show them yet. Good luck finding your book! Sure! The six(!) 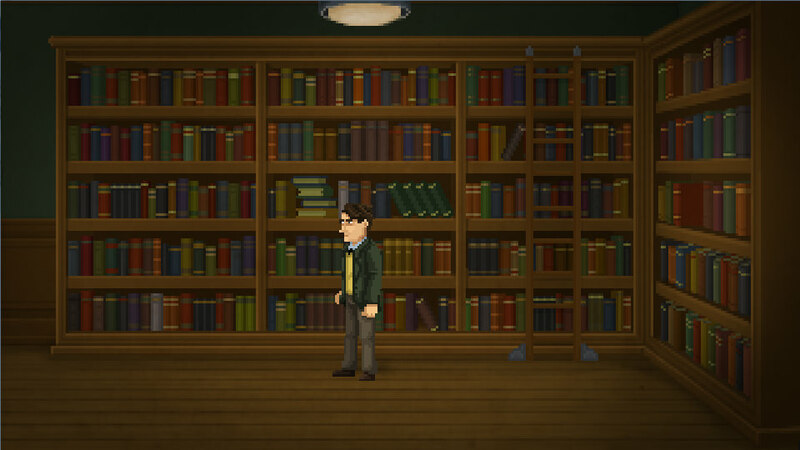 library rooms are separated by the genre (fiction, occult, biology, physics etc). Currently the system is that you can hover over the books with the mouse cursor, and it will automaticly give you the first letter of the author. So that way it's relatively easy to spot the book you want. But you need to know what you are seacrhing for the book to appear. Troy has worked on several H.P. Lovecraft Historical Society's projects, including the feature films The Whisperer in Darkness and The Call of Cthulhu. That is indeed amazing news because both of those movies were incredible but especially the all-important music in Call Of Cthulhu. Being a silent film and all the music was a main star instead of an extra and I remember it being awesome. I wish I knew! Unfortunately I'm not able to work on the game full-time, so there will be gaps in the progress. For example right now I have some other projects to finish, but I think I can get back to the game in a couple of weeks. Let's say that the release date is sometime in 2019! 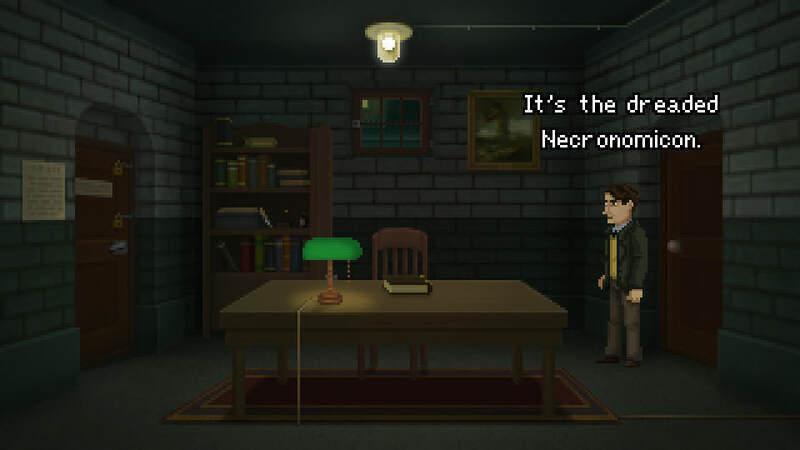 This is the Miskatonic University's basement, where the Special Collection is temporarily stored. Reading these special tomes will give Walter knowledge of the occult at the cost of sanity. I'm so late to this thread but I gotta say - the dream sequence animations look FANTASTIC! Great atmosphere in general too!